I loved the ripe and bold black fruit flavors in this impressive dry wine that’s a treat for people who love pinot as much as I do. The rich fruit flavors of black cherry, boysenberry, and plums are beautifully balanced by notes of blueberry, tangy cherry, minerals, and earth. Such a delightful full-bodied pinot noir, it’s hard to believe it’s so low in alcohol at 13.6 percent. It’s fabulous on its own and the perfect complement to a very special meal like prime rib, filet mignon topped with blue cheese, grilled ahi, quail, or rack of lamb. 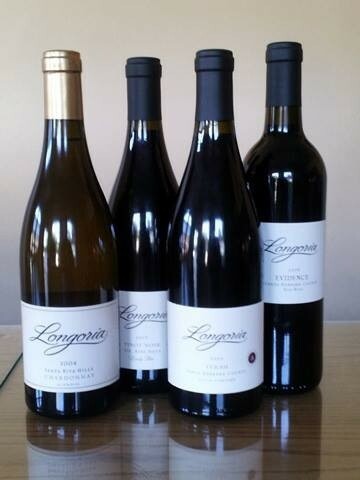 Available only at Longoria’s tasting rooms in Los Olivos or Lompoc Ghetto, it’s only $50 retail for this celebratory wine that will bring you high praise for sharing it. This pinot is a good buy at BevMo! in SLO for only $18.99, where you can get the second bottle for five cents during the sale. If you’re looking for amazing, this isn’t like the one above it. It is, however, a good deal for the budget-minded at close to $9 a bottle when you buy two bottles. It has pleasant cherry, red berry, and spice notes, but it’s weaved with a dominant thread of green peppers and herbs. I liked it best with food, perhaps a pepperoni pizza loaded with melting cheese, tacos with fish or meat, or some grilled tri-tip.